DO NOT ORDER THIS PRODUCT. I previously bought 2 each of this shelf several years ago. Absolutely love them. However, I just ordered a 3rd one, and it is defective. Walter Drake changed manufacturers recently, and the specks are all wrong. The legs no longer fit snugly in the shelf. They are so loose that if you try to pick up the shelf to move it, the whole unit falls apart in a pile on the floor. 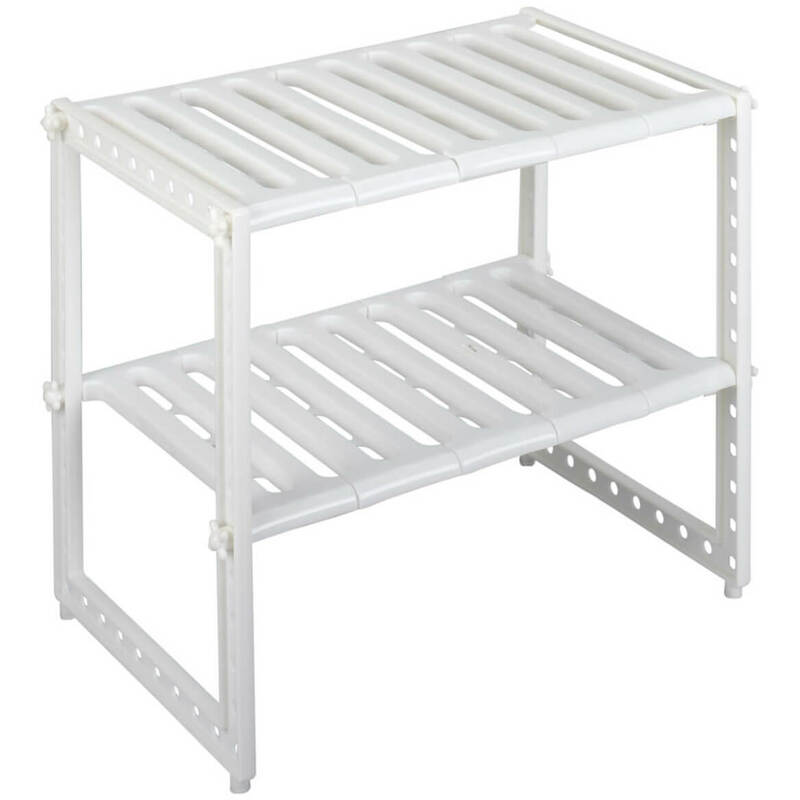 In addition, the shelf is totally unstable due to the loose-fitting legs. To their credit, the company did send replacements. However, the Drake's quality control folks never assembled one before sending it. All 3 replacements fell apart after assembly. I was told the company has 600 units in stock and they weren't sending send a 4th replacement because it would be part of the same manufacturing lot...and very likely defective, too. While I am receiving a hassle-free refund, I was shocked to hear there were no plans to remove this item. ...Why this defective product is still being sold is unbelievable. So be forewarned! This shelf is, unfortunately, NOT of the quality we customers have come to expect from Walter Drake! THE SNAP IS A SNAP.....!!! YES THIS ITEM I ORDER WAS VERY,NICE. IT WAS GOOD FOR WHAT I NEEDED... I USE IT IN MY KITCHEN, I BROUGHT TWO. I MAY BUY ANOTHER ONE ... A CUSTOMER...! This is a very good and sturdy product. Have had mine - 3 of them - for over 2 years. They can go any place you need them, and they fit. Extremely versatile. To those that complained about the size not looking like the picture, I can only guess that you failed to read the dimensions and measure where you wanted to use it. So if you are thinking of purchasing this item, measure where you are going to use it before hand. Then you won't be shocked or disappointed. thes e shelves were so easy to put together. They just snap right into place. My 4 and a half year old son helped me with them. that's how easy they are. I put them in my kitchen For extra space. They are very sturdy and dont move. I couldn't be happier. they help out a lot having these shelves. I don't have many closets in my apartment. This provided much needed storage in the kitchen. It also served as storage for towels, etc. I don't have linen closet. I use these in every place imaginable. I have round corner ones around my pedestal sink, rectangular ones by my stairway banister, square ones at the ends of groupings of 'em, in all sizes and shapes and colors. I use 'em for photos, nostalgia things, figurines. I even put my TP paper & paper-towels around the legs instead of on the TP holder. It's handier that way! I love all my tables! I bought two sets of shelves last year and recently gave a set to a neighbor who was very pleased. Small apartments mean finding creative uses for small corners. These just fit the bill perfectly. Used this item to fill in wasted space on my top pantry shelf. It was just what I needed to give me extra space to store my lesser used items and it filled in space that otherwise was just wasted. I ordered two ... I knew they wouldn't all fit where I needed them so the two leftover shelves also give me extra storage in my laundry/storage room. Excellent !! This shelving completely organizes my printer set-up and gets my equipment out of the way of my pet cats. I also use it in a kitchen nook which otherwise is lost space. It adds space to my counter and puts the microwave safely out of reach of animals. I used the snap-on shelves in a bedroom to place the cable box on and a portable radio.I really liked the ease of putting it together and the overall size.It's fairly sturdy for plastic and goes with just about any decor.The product does what it was designed for and it worked for me.I would purchase this product again. I found this product fit exactly where I wanted it to fit and is useful for organizing all my needs in my very small, apartment sized, galley style kitchen. I'm planning on getting another one for an out-of-the-way corner to organize my cooking utensils to keep them handy as well. I have more than one in every room including my hall way. They're handy for knick-knacks, books, picture frames, CDs/DVDs, memorabilia...I use mine for EVERYTHING! I even found some for corners! I wouldn't trade 'em for anything. They're so portable you can move 'em anywhere you need the extra shelving. Very easy to assemble and disassemble and transport if moving. The main each shelf usable flat area is about 15" across by 10" deep by 12" high. Tubes are tough and the shelves are mildly strong (could bend but hold). A wider deeper maybe taller shelf version would be my suggestion. I have about 10 of them (40 shelves) used on top of file cabinets and in rented tall storage locker. Each used to come with four cute spherical plugs for the now open bare 4 pole holes at top. Product helps me a lot. It was what I was looking for. I use it to put lotions, extra tissue, face soap, etc. I bought this in black for my pantry. I needed some addt'l space to store dog food, paper goods and cleaning supplies. This was so easy to put together. Literally had it done in less than 3 minutes. And it's made in the USA... great purchase! 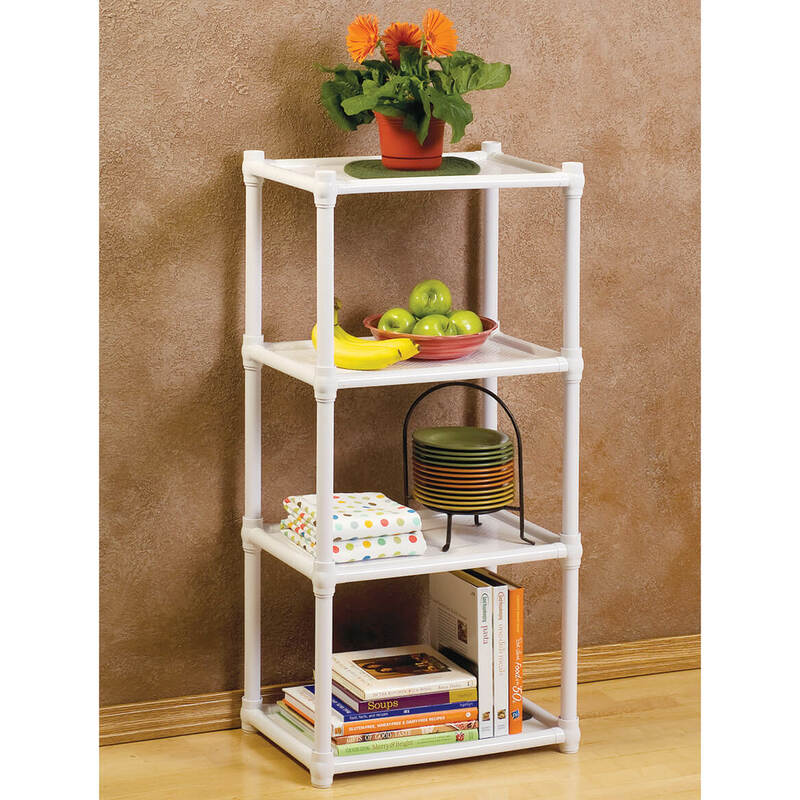 Best inexpensive shelving on the market! The description claims the shelves won't warp but they do. I have several (in several different colors and styles). One of them has a heavy piece of art sitting on it and over time, it has warped the shelf. It sags in the middle. There needs to be a weight limitation on 'em. Otherwise, they're great! 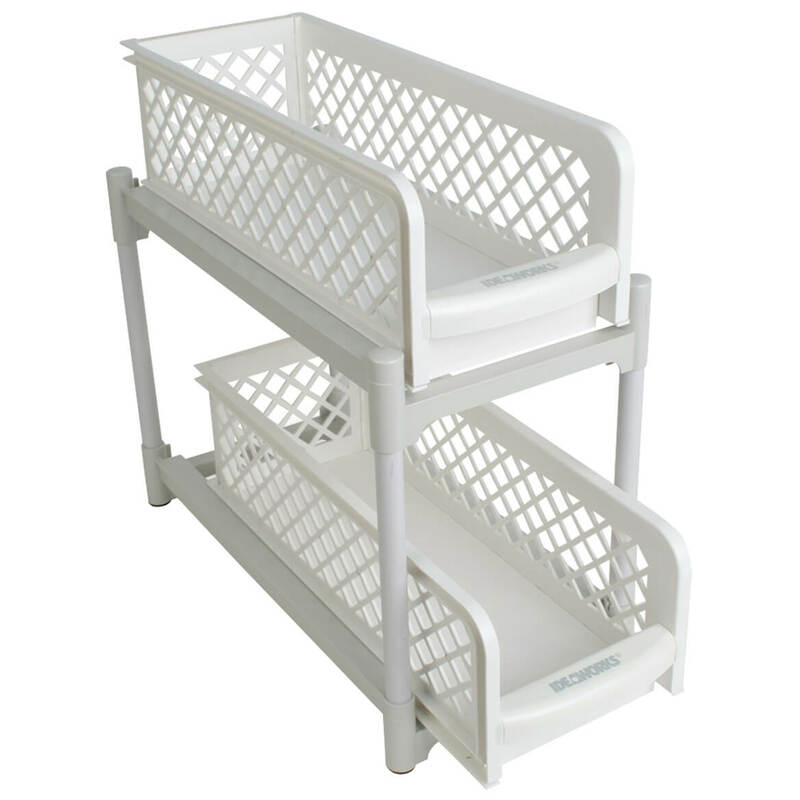 *great in the laundry room, to keep the laundry detergents, and cleaning supplies. This went together so easily and is perfect for what I wanted it for. A little shelving behind a door in my kitchen to hold odds and ends. Thank you. Bought for the space because stove and fridge holding the crock containing cooking utensils and small electrical appliances that are used daily. I have ordered this product several times, always being pleased. This time, however, I seem to be missing a shelf and 4 "legs"
great, it fit right in the little space I had to hold extra towels and wash cloths. My use is for added storage. It is very flimsy. As a storage/organizer for laundry products in a closed space. Looked bigger in the advertisement, not worth the money. While this unit is attractive, the poles do not snap together as stated. Instead, they fit into holes that are too large, and if you try to pick the shelving up, all the pieces come apart. Also, it would look more finished if there were end caps covering the topmost holes. Snap Together Shelves Very Gently; They're Flimsy! I can't begin to describe my disappointment on receiving this product. It shouldn't be sold but given away. What a waste of money. The only reason I'm not sending it back is it would only add to my disatisfaction to have to spend time & money returning it. For display in the living room. It shakes when anything with a little weight is placed on it. Whewn I first opened it I wanted to return it immediately. But, I wasn't sure how I had paid for it. So decided to wait to see if I got a bill for it, which I did the next day. For the size I feel it is overpriced. What happened - the promo code given in exchange for email address was supposed to remove 10% and shipping from total order - but it's still there? Why? I need this for my den. Easy to Assemble, easy to clean, eligible to serve as purpose. Needed shelves for laundry room. have one and they are easy to assemble & provide good organization! I collect bird houses and these shelves are just right for the Minnie collections. They are exactly the right size and color for my studio. We need more storage in our kitchen. 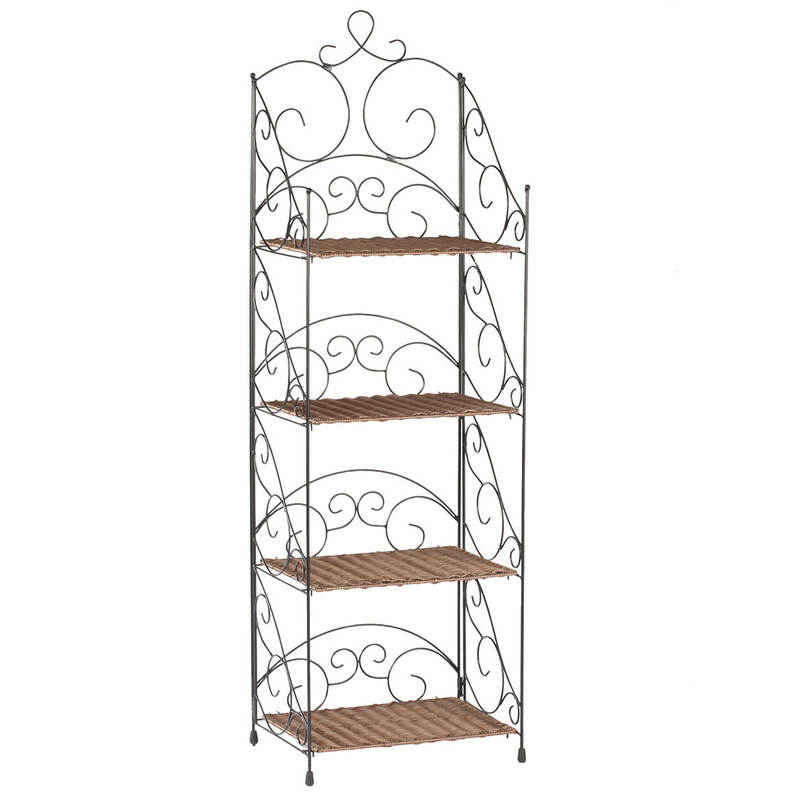 Two of these shelving units will meet our space requirements. It was the right size and color for holding filing cabinets of computer and design equipment. For magazines and products small enough to use in the bathroom. 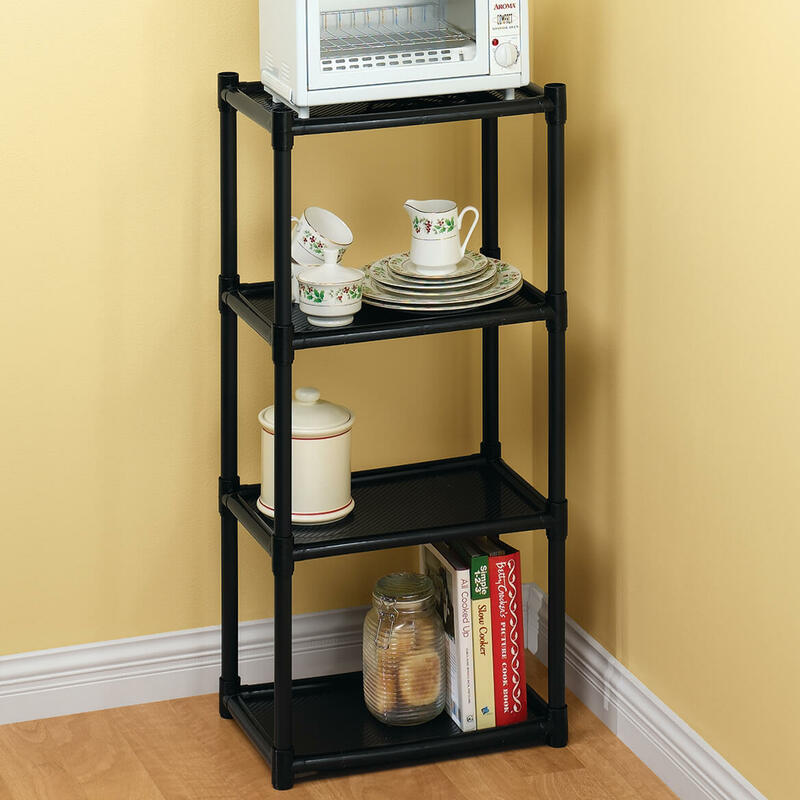 my other storage shelf is warn out and I need something like this b/c it looks easy to put together and can hold a lot of stuff, I just hope that it is as strong an sturdy as they say it is. I chose this because my mom has one it's very sturdy and holds a lot. do not recall buying these shelves ?????? I need this in my bedroom for extra storage. Price, Color, AND I PRAY, QUALITY!!! To place my CPAP at a good height to reach it. Needed small shelving for choir books at church. I already have a set and this is an easy solution to space saving. have a white one and love it..so now i need the back one! I want to put my printer on the top shelf and have the other shelve's for other things. I bought one previously and wanted another one. 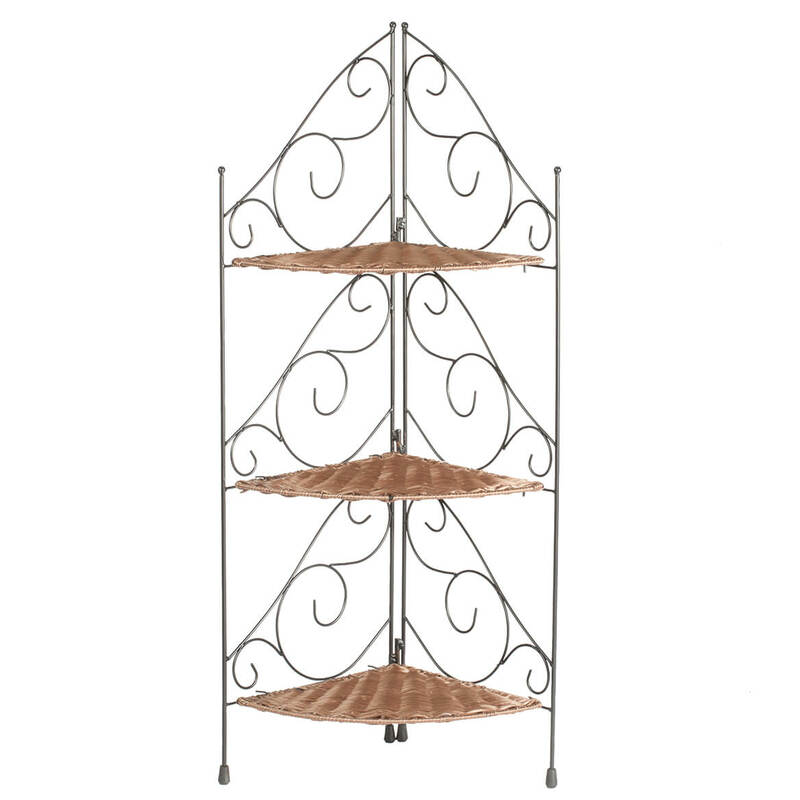 Looking for some quick easy movable shelving that I can use anywhere in my house or garage. I am going to use this to turn my closet into a food pantry. It will fit just right because I have a small apartment. recent reviews were good and the price is right. Height is 40" total. How much space between the shelves? BEST ANSWER: Thank you for your question. There is 12" between each shelf. We hope this information will be of help to you. 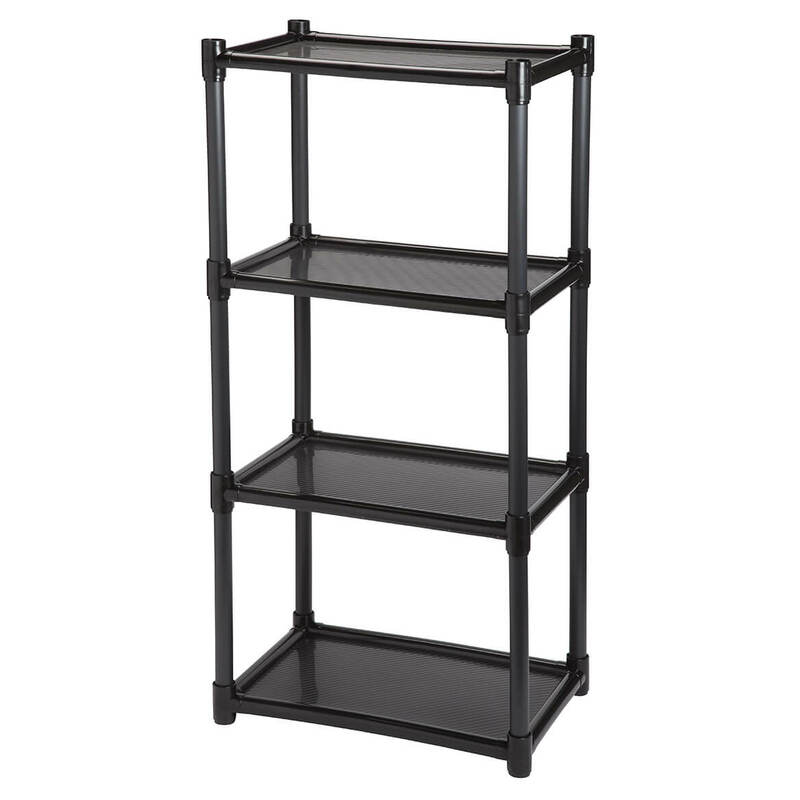 How much weight does one shelf hold without bending? BEST ANSWER: Thank you for your question. Each shelf has a weight limit of 25lbs. We hope this information will be of help to you. WHAT IS 12 1/2 D? what does the D stand for? BEST ANSWER: D stands for the depth of the shelves. From to back. D stands for depth. Measurement from front to back. how deep (space) the unit has. can you stack 2 together? BEST ANSWER: Thank you for your question. Two could be stacked together, however the stability will not be good and the top could easily fall. We hope this information will be of help to you. It would be possible to stack two together, but I think it would result in it being very unstable.